Comic Book Ink is my favorite comic book shop ever. It’s also the location of my first book signing. 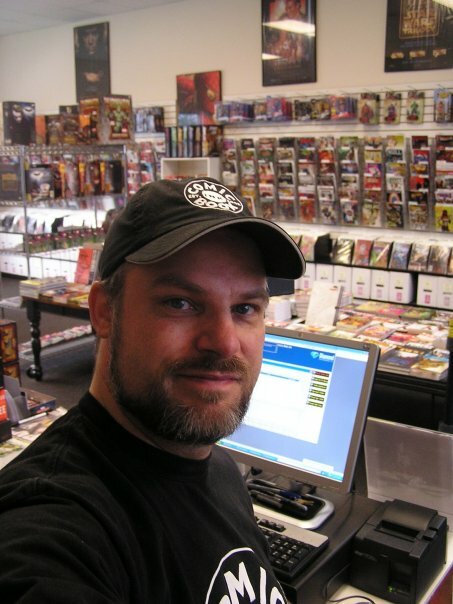 John Munn is the owner of Comic Book Ink and one of the most giving, generous people I’ve ever met. He’s the sort of person who makes Tacoma a great place. He’s had a very rough year and it’s catching up with him. I knew before I wrote this, that this would be the most difficult message I would ever have to write…and I have been putting off writing it for sometime. But the Memorial Day Sale did not make the immediate debt relief that the shop needs and I have to send this message out. I have always said that I would be truthful about how the shop is doing….And here is an honest truth. Through no one’s fault but an economy that is being slow to recover, we are on the verge of closing our doors by as soon as this August…if not possibly sooner. When we moved from East 72nd & Portland to our current home next to the Lakewood Regal Cinemas…We had a debt (not including money lent by our Angels) around $115,000.00. But this was a debt that included bills that we were juggling. We were honestly behind in some of our bills by 6 months(including a back debt to Diamond Comic Distributors). The new location has been doing very well…We’ve been eating into that debt pretty quickly. Losing my friend Marcus, the managing artistic director at Lakewood Playhouse, to cancer and choosing temporarily filling his position through the end of the year. I have juggled as far as I can juggle. I have kept a constant vigil on our shop, but currently it is resting on a house of cards and not a strong foundation (yet) that could go at any minute. We are at a debt of 2 months behind in bills, including a new back debt to Diamond Distributors (not including our ever patient Angels). It is a total of $30,000.00. I need your help. This week is bad…Very bad. Some immediate help would be appreciated…to stop some crises. This can be returned by the end of the year. Some longer term…perhaps holding off on repayment until next year. The shop has a credit line, but it is maxed out. It gets paid monthly and Wells Fargo has been very understanding. I have been depositing all of my paychecks from the Lakewood Playhouse to cover any payroll for the extra hours that my employees have been covering when I am not here. I have made arrangements with all of our debtors (including Diamond and our current landlord)and am on payment plans with all of them. But I have juggled as long as I can and if I miss a payment to one, it will begin to unravel the others as well. I have sold off the bulk of our back issues at a lower price than I probably should have. To be truthful, they weren’t moving that fast in the store and were taking up so much room both on (and off) site. Let go of staff and replace them with my unemployed wife, or my eldest son’s mother who is also out of work through no fault of her own, both of whom will work for free. Alex (7+ years), Bill (7+ years), Josh (3+ years) and Carmen (1+ years)are the lifeblood of this shop. They are more important to it than I am. We will all finish together. Shut the doors now, declare banktruptcy and cut my losses. That’s simply is not an option to me. It hasn’t been since day one and it won’t happen now. You..and your patronage…are more important to me than I can possibly put into words. I have sacrificed too much (including my house and, yes, even some friendships)to keep this store alive…and I will not fail you. Have a fire sale, pay off my Angels, give my staff severance of three months and close the store. I could do this tomorrow, but I am not giving up. If it becomes a reality because I can’t juggle anymore…I will have to. But right now? I simply will do everything in my power to prevent that from happening(including writing this letter to you). And now I come to the part where I have to ask you something that I didn’t want to ask. Please, pick up your Comic Book Files and/or Special Orders Weekly. We are CARRYING A LOT of FILES & SPECIAL ORDERS right now. There is, more than likely, more than $30,000.00 sitting in the files * special order closet right now. If you are local, and haven’t received your shipped books, please drop by and pick them up through the summer…even if its once a month. I am so sorry, but shipping has gone way up (and I have been charging you the old rates). Buy a Comic Book Ink GIFT CERTIFICATE and don’t use it for awhile. I would like to do the “Added Discount Bonus”that we have done in the past, but it simply cannibalizes our sales beyond the short term relief. If you could provide us with a short term loan that you could hold off on for awhile or that we could pay back with small payments. It would be appreciated beyond measure. Buy a Share of Comic Book Ink that I could buy back from you in 2012 or 2013 (in what would be the store’s 10th Anniversary year). This is something I have never done, nor offered, before. I am willing to sell shares of Comic Book Ink Inc for $1,000.00 each…with the knowledge that I could repurchase them back from you at rate of $1,100.00 each in 2012 or $1,200.00 each in 2013. This is limited to a total of 40% of the store’s shares of 100. I honestly don’t know what else to do. If you can do any of these things…as soon as you can…I would be grateful. If I am not at the shop, as I am probably over at the Lakewood Playhouse, please ask the staff for my cell phone number and call me. We are going to try for the Will Eisner Spirit of Retailing Award this year. You nominated us and we are going to try. I have two passes given to us from Diamond Comics. One for me and one for Carmen. I do not know if I will be able to afford to travel there…and we, currently, have no where to stay. But we are going to try. THE VAULT AT MIDNIGHT won last year…and they were unable to make the trip. What is my short term plan? I have given myself a deadline of August 22nd, 2011 to see if the store can make it. Why that date? Its the 9th anniversary of the day I applied for our first business license. If it cannot make it, I will consider myself a failure and begin the process of dismantling the shop. I will see to it that all of my Angels are repaid, stock repaid at the rate bought this year, give my staff severance of three months and close the store. I think we can make it. I wouldn’t have sent this message if I didn’t. I did not want to write this letter. I did not want to ask for help. All I ever wanted to do was to create a place where people could come and escape for awhile. A place that would invest in the community, and its organizations, that surrounded it. You have kept us going for 8 years. You have nominated us for the Eisner Award 7 Times. You have voted us Best in Western Washington. You have helped us make our Comic Book Shop, no matter the location, feel like a home. Thank you for all of the years you have given me. I’m not giving up without a fight. This entry was posted in Life in the 253, Tacoma History, Tacoma Places and tagged Comic Book Ink, Tacoma Comic Book. Bookmark the permalink. Thanks Jack Cameron ! Maybe there is something the CLAW can do as well. Must add this to the agenda of next secret meeting! I was wondering how is he doing now with his business? Is there a way to catch up with him? Unfortunately these days Comic Book Ink is a thing of the past, but John Munn is still very active in the community running the Lakewood Playhouse and putting on some of the best plays in the Northwest.